Tritech Fall Protection Systems offers the most technologically advanced OSHA / CSA compliant fall arrest and fall protection products and equipment in the United States and Canada. Tritech’s solution starts with a thorough assessment of fall hazards in your facility, followed by a customized fall protection designed to meet and exceed your needs. 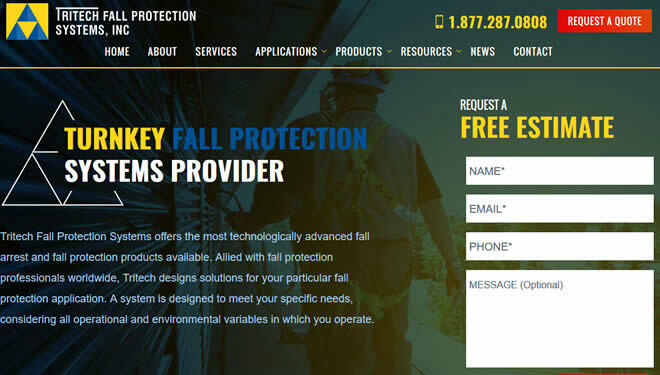 Our turnkey solution starts with a thorough assessment of fall hazards in your facility. We then familiarize you with a wide range of available options before recommending the most cost-effective, OSHA/ CSA-compliant and user-friendly system to meet your specific requirements. From Supply and Installation to Certification, Training and Servicing, we effectively shoulder project management for you — and give you much-needed peace of mind. Visit our website for in-depth information on everything we have to offer.